New French Edition added. Sponsorship Breakdown is for permanent residents and conditional permanent residents who need help when the person sponsoring them in Canada is no longer supporting them, and they are unable to support themselves. Explains what happens when a sponsorship breaks down, and how to apply for welfare. This booklet provides a summary of the key features of the Manufactured Home Park Tenancy Act and how they affect landlords and tenants in manufactured home parks in British Columbia. Roads to Safety is a legal handbook for older women in BC that covers legal issues that older women may face when they have experienced violence. It explains rights and options, using stories to illustrate the legal information. Formed through a partnership between West Coast LEAF and UBC’s Allard School of Law to provides free and low-cost legal services to women. Services are provided by upper year law students, under the supervision of staff lawyers. Rise offers a range of services, from information and summary advice, unbundled legal services, and in some instances representation in court. Currently accepting appointments for Tuesdays and Wednesdays from May 24 to July 20; fall dates TBA. I’m a refugee abroad. How can I get to BC (Canada)? What is the difference between Personal Planning and Estate Planning? What can a landlord ask or require of me before renting? This study assesses outputs & outcomes of the JP Boyd on Family Law wikibook by analyzing data from Google Analytics and data collected from a pop-up survey of users, a follow-up survey administered 1 week later and a follow-up survey 6 months later, to gauge the efficacy of wikibooks as a collaborative PLE model. The guide discusses the legal rights and responsibilities around disclosure for people with disabilities in the context of employment. This report is grounded in diverse women’s real-life stories about how the inadequacy of the child care system has impacted them and their children—undermining their safety, well-being, & human rights. The report analyzes the legal implications of these harms and calls for urgent government action. Updated for 2016, this booklet explains when to report child abuse and neglect, and what to report. Includes what child abuse and neglect is, warning signs, what to do if a child tells you about the abuse, and what to do if you suspect abuse. It also explains what to expect when you make the report and what happens next. See the recording of our live 1-hr webinar for front-line community workers, advocates and public librarians. 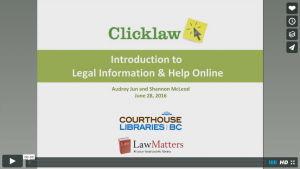 Learn how to search online for reliable legal information & help specific to BC, with an overview of how to use Clicklaw, the HelpMap, and the Clicklaw Wikibooks. 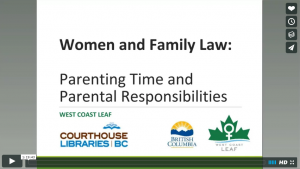 See the recording of this live 1.5-hr webinar on recent changes to family law in BC and their impacts on the parenting experiences of women with abusive or harassing exes. Speaker Zara Suleman considers some common legal challenges including parenting assessment reports, denial of parenting time, relocating with a child, and litigation harassment. Zara offers lawyers and frontline service providers who assist women fleeing abuse effective strategies to cope with and address these issues. You may have noticed that some of the links to websites hosted by the BC Government may be broken as they restructure. We are currently working with BC Gov website staff to keep links updated. For example, see the updated link to Family Justice in BC.